A delicious soft and buttery shortbread cookie filled with dried cranberries and fresh orange zest that’s the perfect easy-to-make Christmas cookie. Last year, I discovered this cranberry orange shortbread cookie recipe and immediately knew I had to try it. And while the cookies turned out delicious, the process to make them was more than I liked. SO, using the same recipe as a starting point, I modified the process so that you can enjoy these ultra-buttery cranberry orange shortbread cookies and not have to spend forever making them! By the way, if you think shortbread is not your thing just give these a shot. They are not the dry, crumbly shortbread you may have tried in the past. They are full of flavor, soft and super buttery. You do need to be careful not to over bake them so that they don’t get dry and sandy. The big difference between my version of this recipe and the original is that I mixed everything together in my food processor. Well, I say food processor but I actually used my Ninja. If you have a Ninja, a Vitamix or a food processor, any of them will work. I tried cutting in the butter with a pastry cutter like the recipe called for, and it took me the best part of 30 minutes to get the fine breadcrumb texture that’s needed for these cookies. No thank you, I have better things to be doing! This is also a great make-ahead recipe, since the dough needs to chill in the refrigerator for at least 2 hours before baking. I like to make the dough the day before I need it and then bake them fresh the day of. Dip them in sugar before baking or spoon some over them when they are fresh out of the oven to add a little crunch. Delicious! These cranberry orange shortbread cookies are one of my all-time favorite Christmas cookies and I know you’re going to love them, too! 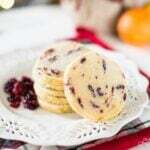 A delicious soft and buttery shortbread cookie filled with dried cranberries and fresh orange zest that's the perfect easy-to-make Christmas cookie that no one can resist. Combine cranberries and 1/4 cup of sugar in a food processor and process just until the cranberries are broken down into smaller pieces. Pour into a bowl and set aside. Combine flour, salt and remaining sugar into the food processor. Add the cubed butter and pulse until you have very fine crumbs. Pour flour mixture into a large mixing bowl and combine with cranberry and sugar mixture. Stir in vanilla extract, orange zest and orange juice. Shape dough into a log by rolling it out until it's about two inches in diameter. Cover with plastic wrap. Refrigerate for two hours or up to 72 hours. Using a large sharp knife, cut slices of cookie dough about ¼ inch thick. Place cookies on baking sheet and bake for 12 to 15 minutes or just until cookies are set. Do not over bake. In my oven, they need the full 15 minutes but if you're using a fan oven pull them at 12. You may need to experiment with the time to find what works for your oven. Let cookies cool for 15 minutes on baking sheet before removing to cooling rack. Let cool completely. Baking these cookies as I write this. How many should I expect? My cranberries shot around my Ninja like angry birds. Had to cut them up, but the rest of it worked out fine. Shortbread anything is a big like in this family so this will be a fine addition. I love everything cranberry orange & shortbread too, so these are right up my ally! Pinned! I love the combo of orange and cranberries & they are so pretty too! Can’t wait to try this delish lookig cookie. Thanks for sharing. I love shortbread at Christmas and these sound so good! They’d make perfect neighbor gifts! Jenna, I love that you found an easier way to make these cuties. They look delish! Oh Jenna Kate, these sound delightful. Perfect with a cup of tea, coffee, milk or heck, all by themselves. Christmas is the time when I give myself permission to bake and eat with (almost) abandon and I’m happy to add these to my repertoire. 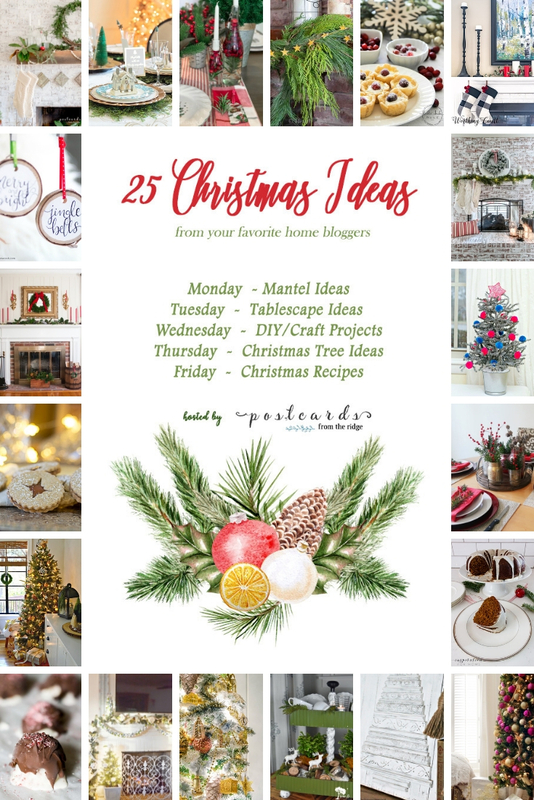 These look so good and I am definitely going to make them at some point this Christmas season. Not only do they sound delicious, they are so pretty! Jenna, this recipe sounds so yummy. I love the combination of orange and cranberry and will have to try this one! Thanks for joining the tour!